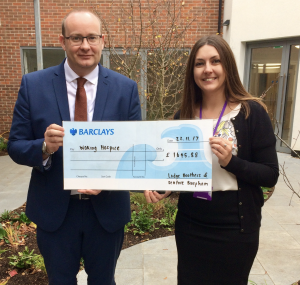 Lodge Brothers and Seafare Fish & Chip Shop of Burpham joined forces for a ‘Feel Good Friday’ Fish & Chip Fundraiser on behalf of Woking Hospice last Friday 3rd November. Lodge Brothers pledged to donate £2 to the hospice for every fish and chip meal sold on the night. With live music from guitarist George Gervasio and complimentary prosecco and beer, the crowds were out in force! Andy from Seafare confirmed that 388 meals were sold, resulting in a donation of £776 from Lodge Brothers, which was then matched by Seafare. And with the additional donations taken by our wonderful waiter and waitress, Robert & Beverley Lodge, with their collection tins, the grand total reached almost £1,600!! All in all a fantastic fun way to raise funds for an incredibly worthy cause. Well done everyone involved.